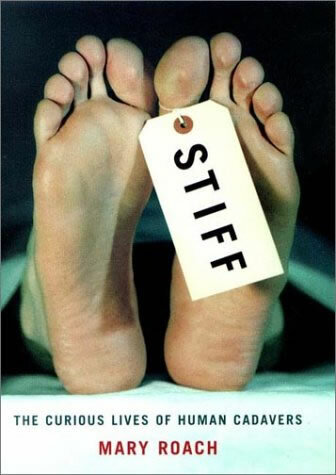 Stiff tells various tales about what happens to our bodies after we die. From experiments with car crashes and bullet impacts, to good old cannibalism, it's a fascinating look at some stories that would usually remain buried. Aside from being willing to go places few people would dare, Roach's strength is in the personality that comes through in her writing. Rather than a dry reporting of facts, she describes in first-person her experiences with people—both living and dead—who she sought out to research the book. Describing her own reaction to every odour adds a real punch, but her sense of humour is always there to keep it from going too far. I listened to the audiobook edition, and Shelly Frasier's narration is perfect. Her perpetually sardonic tone perfectly captures Roach's darkly sarcastic writing. It doesn't all come up roses. The gross chapters—like the one devoted to research on human decay—are always, um, engrossing. Others can be dry. In the chapter on new methods of disposing of bodies (such as removing all the moister, shattering them, then using them as compost), Roach describes, in great detail, a conference she attended where these methods were debated. While an inside glimpse into the politics of the funeral industry is interesting for a few pages, it goes on for way too long. Stiff is lively more often than not, though, and is definitely worth reading for anyone interested in the deader side of life. I read this years ago for my forensic anthropology class. I loved the chapter on crash test dummies. I so want to be a crash test dummy. I haven't read stiff yet, but I did read Bonk. The questions she researches to answer are incredible. I do think she loses the reader in certain chapters (such as the pig sexual relations in Bonk), but all in all very entertaining to read. I can't wait to read Stiff as well. Thats really interesting... I almost never want to read non fiction, but this one intrigues me. Thanks for the review! Shine: Me too. Remember that Crash Test Dummies cartoon and the awesome toys that went with it? I can't wait until I'm dead. Interesting review, I think I'd like to read the book. I have difficulty handling death, and it seems this more "open" approach is on the rise...could be good for me.